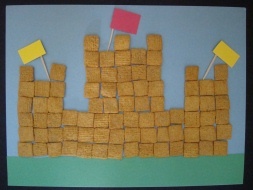 Turn breakfast into a fun Cereal Castle! This craft is easy to make, but make sure you have some extra materials for munching! A great project for any little princess or knight! 1. First you will need to prepare the paper. Glue a strip of green paper onto the bottom of a piece of blue paper (if your using cardboard just glue or tape construction paper on top). 2. Start gluing square cereal onto your paper. Build your castle any way you choose. 3. Cut small squares out of construction paper and tape or glue onto a toothpick. Glue the flags onto your castle.